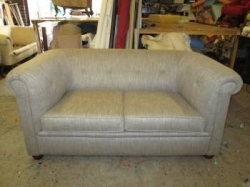 A well made smaller proportioned two seat sofa. Constructed from beech with solid wood internal arm tops (no cardboard, osb2 board or chip board). Dating back to the early 80s, this stylish scroll arm sofa can be fully restored/renewed and recovered in any fabric or leather of your choice. Dimensions - height 69 cm, width 154 cm, depth 94 cm. If you require a smaller sofa, please don’t hesitate to call us to discuss all price options available for you. Last picture/image shows what the sofa could look like completed.